CE approved ( patent NO. 45155 ). 1. The smallest model in twin conveyor table series. Designed for performing sealing at both sides simultaneously. Features two CC-6201 in one. 2. Two control systems permit for single or double sides operation. It provides high production capacity, high efficiency,and space saving. 4. Combines bag sealing,knurling and date coding(optional)operations. 5. IC controlled circuit provides convenient maintenance. 7. 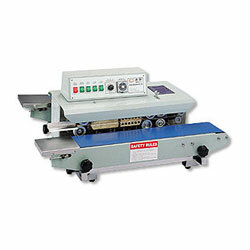 Accommodates both teflon and steel sealing bands for sealing all types of plastic,porlycell,and aluminum foil bags. 8. Conveyor can be horizontally adjusted to meet various bag sizes. 9. The cooling fan ensures maximun tightness of seal. 10. Ideal for sealing grit, solid goods,hardware kit,toys,bread,and medical instruments...etc.